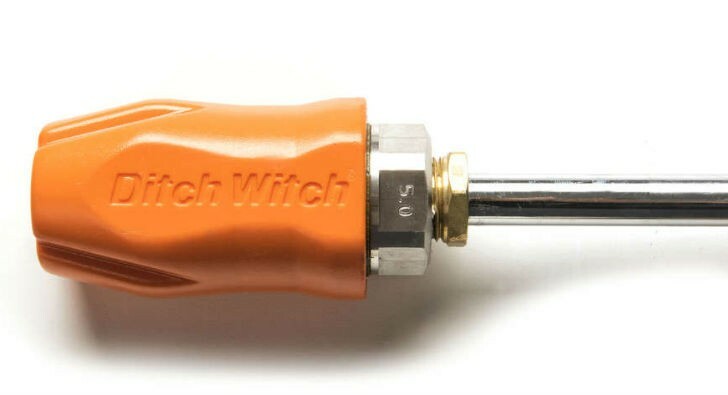 Ditch Witch Prospector Nozzle . Compatible with all Ditch Witch vacuum excavators and other competitive models, the nozzle reduces water consumption on the job while its cone-shaped cut mitigates damage to underground utility lines, aiding operator’s safety and productivity. The nozzle’s rotating, conical design provides an 18-degree cone of optimized coverage, ideally suited for a variety of hydroexcavation tasks. Constructed with durable, stainless-steel housings and tungsten-carbide wear surfaces, the Prospector Nozzle is able to withstand excavation in harsh environments while also giving the accessory a longer life compared to other nozzles on the market. The Ditch Witch factory also has introduced the Prospector Digging Lance, which uses a vertical trigger for more ergonomic operation. The lance improves operator comfort and helps keep operators in an upright position during excavation jobs. To accompany these accessories, repair kits are available for the Prospector Nozzle. The kits include spare parts for the nozzle that operators can use with Ditch Witch or other manufacturer’s excavation models to reduce replacement and upgrade costs. The new Prospector Nozzle is compatible with all Ditch Witch vacuum excavators and other competitive models.